"The Dream of St Ursula", a 1495 painting from a series by Vittore Carpaccio. Depicting a young princess being visited by an angel, it currently hangs in the Galleria dell'Accademia in Venice, Italy. © 1990 Scala, Florence. Inspiration can be found in the oddest nooks and crannies. 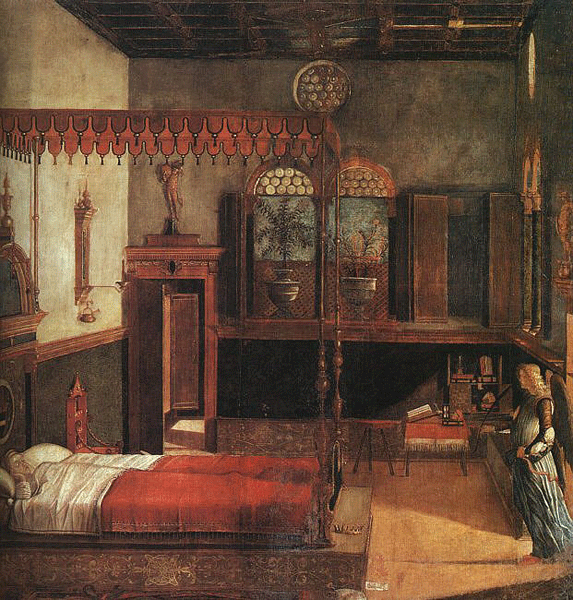 As Stephen Calloway's intriguing Twentieth Century Decoration (1988) explains, a quattrocento tempera painting called The Dream of St Ursula, for example, has inspired two known beds and likely a handful of others yet to be discovered. The work, executed in 1495 by Venetian artist Vittore Carpaccio, depicts the young lady in question—a teenage princess doomed to martydom—supine in a majestic canopy bed set on a high inlaid platform or predella, its elaborate tasseled valance held aloft by delicate attenuated posts. This particular Carpaccio, one of a series of eight scenes examining the saint's life that was hailed by critic Bernard Berenson for its "vivacity and gorgeousness", originally hung in a school for orphaned girls dedicated to St Ursula; today it resides in the Gallerie dell'Accademia in Venice. Berenson proclaimed the painting less a portrait of a saint than "the picture of a room with the light playing softly upon its walls, upon the flower-pots in the window, and upon the writing-table and the cupboards". True enough, because the sleeping subject is the least interesting part of the work. It is the limpid, barely furnished but strangely opulent interior—"a vivid impression of a Venetian bedroom in the late fifteenth century", according to one architectural historian—and in particular the astounding bed, that commands attention. John Ruskin, the British artist and critic, who first saw this painting in 1869, described it as "a broad four-poster, the posts being fully wrought golden or gilded rods, variously wreathed and branched, carrying a canopy of warm red". Carpaccio surely based it on something he had seen, say, in a palazzo of his time. The rooms of that city are rich with beds of all kinds of elaborate descriptions but this model—commanding yet curiously weightless, skeletal yet sumptuous—seems not to have survived anywhere to my knowledge. Bedroom of Barbara Rutherfurd, 660 Fifth Avenue, New York City, New York. Both the bed and the chair beside it are copied from Carpaccio's painting. This image, by an uncredited photographer, was published in British "Vogue" in August 1917. Around 1916, a Manhattan post-deb named Barbara Cairncross Rutherfurd (1895-1939) woke each morning in an apricot, rose, violet, and black room whose furnishings carefully reproduce those in the St Ursula painting, right down to the curious throne-like chair that appears on the canvas. Dominating the space is a bed that is a very slightly simplified adaptation of Carpaccio's virtual version, its headboard free of gilding and the pradella shallower and free of inlay. Its towering, theatrical character was a perfect complement to the Sleeping Beauty splendor of the Rutherfurd's home, an 1881 turreted French Renaissance castle designed by Richard Morris Hunt for her stepfather, William Kissam Vanderbilt Sr; her mother, the former Anne H.S. Rutherfurd, became Vanderbilt's second wife in 1903. 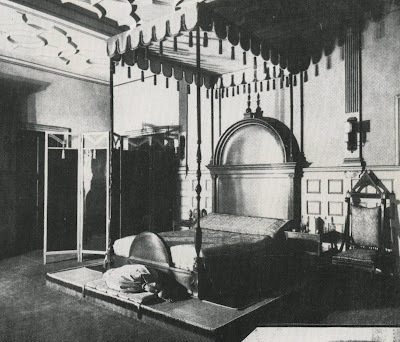 The eccentric bed also was perfectly suited to its occupant, a creature of electrifying Casati-like beauty who eventually married twice, grew increasingly unbalanced, was committed to a sanitarium, and died at only 44 years of age. A photograph of this troubled soul, seated in the Carpaccio-style chair, is reproduced below. Somewhere there exists a circa-1921 portrait of her by sculptor Renée Prahar, a fashionable talent of the day, the work once described as "a lead intaglio set in ebony" and so highly polished that the lead possessed "the moonlight glow of old pewter". The decor of Rutherfurd's bedroom, as described in British Vogue in 1917, deserves to be recounted in full: "The colour plan is made up of tones of apricot, rose, and violet, accented in black, which gives it character. 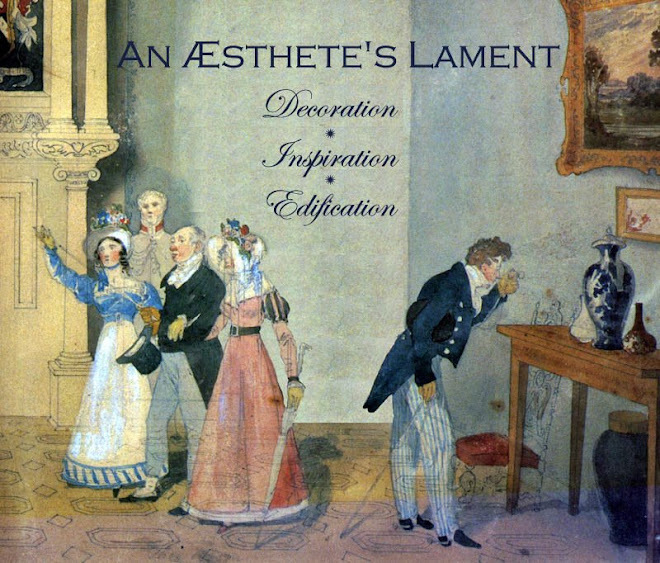 The dado, mantlepiece, and ceiling, as well as the rough plastered walls, are all in tones of apricot, much glazed with violet; this produces an unusual mellowness and makes the tones in the different parts of the room vary according to the light and the hour of the day. The carpet is of a deep violet, and the doors and all the furniture are of black lacquer with the least bit of gold introduced. The bed ... is of black lacquer with a bedspread and day cushion of mauve and gold brocade. The canopy, nine feet high, is in cloth of gold lined with mauve velvet, and mauve tassels decorate it; the pillow at the foot of the bed is of turquoise blue velvet. The screen is composed of black glass panels and is hung with tassels of mauve. The wall lights are of black glass plaques mounted in gilt metal framework. The curtains for this room are of deepest violet damask, and violet and apricot-rose gauze inside curtains complete the window". What happened to the bed and the chair is unknown. The name of the furniture's designer is also obscure, though at least one researcher attributes the bed to Geoffrey Scott (for more about him, see below). Between 1915 and 1916, Bernard Berenson, whose assistant was Scott, had published two widely read articles about Carpaccio, which brought the Venetian painter's work to broader attention in an era when Italian antiques had begun to transfix certain members of transatlantic society. And it is known that Anne Vanderbilt, Rutherfurd's mother, moved in the same circles as Scott, Berenson, Elsie de Wolfe (she would decorate Mrs Vanderbilt's house on Sutton Place), and other contemporary tastemakers. So perhaps Scott did have something to do with that Fifth Avenue interior. More research will have to be pursued. What is known is that Barbara Rutherfurd married Cyril Hatch, her first husband, in 1916—apparently not too many years after her bedroom's completion—she soon moved into the starkly handsome Spanish Revival house that The New York Times reported was a wedding gift from the bride's mother. Its architect was Frederick J. Sterner. (Later owned by stripper Gypsy Rose Lee and later still by artist Jasper Johns, the East 63rd Street residence now belongs to director Spike Lee.) At present there is no indication that the St Ursula bed made the move uptown with the newlywed Mrs Hatch. Perhaps it was simply sold, sometime between the closing of the Vanderbilt house after her stepfather's death in 1920 and the vast mansion's demolition in 1926. Barbara Cairncross Rutherfurd (Mrs Cyril Hatch) as a newlywed. She is seated in the same throne-like, black-lacquered chair that stands to the left of her bed at 660 Fifth Avenue; it also was copied from the Carpaccio painting. 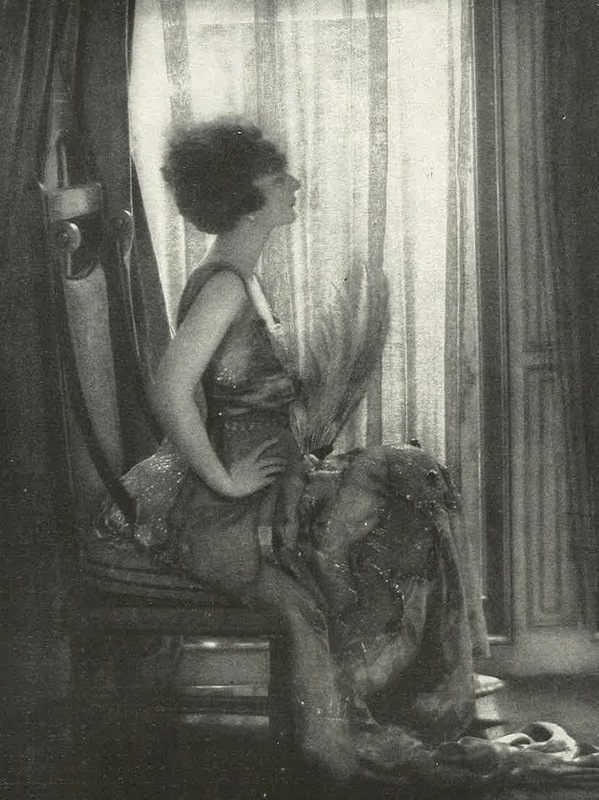 This image, unsigned but seemingly the work of Baron de Meyer, was published in the February 1917 issue of British "Vogue". 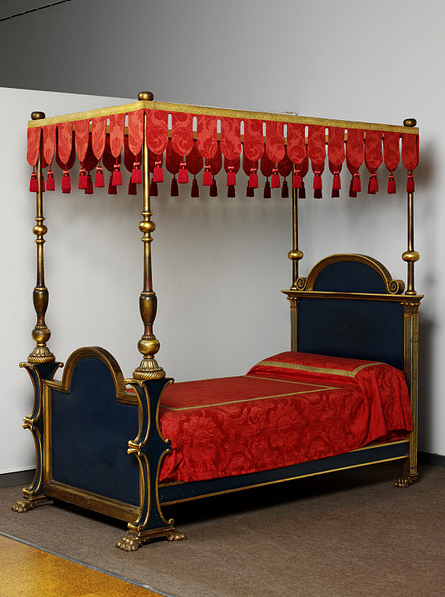 Another example of the St Ursula bed has been in the collection of the Victoria and Albert Museum since 1984. Credited to architect and art historian Geoffrey Scott (author of The Architecture of Humanism) and a London upholsterer called M. Southgate, it was made in 1922 for Scott's cousin William Heywood Haslam (1889-1981), heir to a cotton-spinning fortune and perhaps best known as the father of British interior decorator Nicky Haslam. Some scholars have claimed the bed was created in Florence, Italy, in 1914, but additional research has ascertained a different date and place of manufacture. Moreover, Haslam's is an adaptation, vigorous but significantly different from the quite careful replication executed for Barbara Rutherfurd. Scott dramatically altered the headboard, for instance, reducing its aristocratic arc to an suburban echo and dispensing with its exclamatory urn-like finial. He also created boldly sculpted bases for the posts, which themselves have been pruned and thickened, and mounted the bed on six gilded lion's paws. 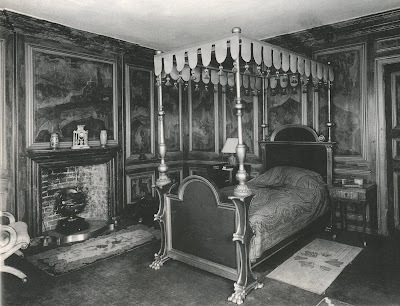 William Heywood Haslam's bed in the 1930s, as seen in the Grotesque Room of his country house, Great Hundridge Manor, Chesham Road, Hyde Heath, Chartridge, Buckinghamshire, England. Painted peacock blue, lavishly gilded, and crowned by an open canopy fringed with brilliant red Venetian silk damask, the bed was reputedly was ordered for Haslam's London residence, 8 Hanover Terrace. After his marriage to Diamond Ponsonby in 1930, however, it migrated to the couple's late-17th-century country house in Buckinghamshire, Great Hundridge Manor. There it was placed in Haslam's own bedroom—Scott designed a more feminine bed for his cousin's delightfully named wife—the so-called Grotesque Room, a first-floor chamber lined with bevelled paneling and extravagant landscapes framed by faux scagliola. To see Scott's bed for William Haslam in its fully restored glory, simply look below.